HomeCurrent affairChina arrests Canadians retaliation to Huwaei CFO arrest. China arrests Canadians retaliation to Huwaei CFO arrest. 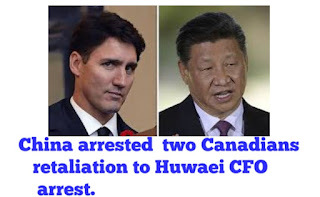 To retaliate Huawei CFO arrest in Canada, China arrested two Canadian officials in US-China trade war. The arrest of Huawei executive roiled the business world and threatens ugly trade war between US and China. Meng Wanzhou, chief financial officer (CFO) of Huwaei company was arrested in Vancouver, Canada while attending conference in Canada on the behalf of United States. She was accused by United States of helping Iran, North Korea through Huawei telecommunication equipments and that is the violation of sanction on Iran under CATSA act according to Canadian prosecutors and she may be jailed for 30 years. To retaliate action of US, the China has also arrested Canadian. Huwaei CFO released on Bail in Canada Meng Wanzhou a 46 year old granted bail on $10 million (note- out of these punishment $7.5 million in Canadian currency ). she also agreed all conditions of court and has surrendered her passport and will line in one of her home in Vancouver, Canada. She will pay for her security (around the clock security detail ) and will also wear GPS ankle bracelet (which is weared around ankle to catch location of her ). Such a harsh punishment to CFO of Huwaei company which one of the no1 company in next 2-3 years and daughter of Chinese richest person. Global Times reported that, ‘China will take revenge‘. If Canada doesn’t free Huwaei CFO Meng Wanzhou safely. In China on Social-media and newspaper, it is said that relationship went beyond trade-war. In China some reports that US and western countries openly trying to pressurised China as it was done previously behind door. Global Times also stated that Meng Wanzhou should be given freedom while living on Bail and put an end to this incident. Chinese foreign ministery said, It had summoned both ambassador of US to Canada John McCallum and US ambassador Terry Branstad to address Meng’s issue which described as “Lawless, ruthless and reasonless”. In retaliation to Huawei CFO arrest in Canada. China has detained two canadian officials which were in China. They are including former diplomat Michael Kovrig and enterprenenuer Michael Spavor. Now the real hostileness starts. If someone says it is coincidence then they should know that ‘nothing can happen as coincidence in China’. US, China and Canada executives are wary of travel to one another country country after Huwaei arrest. Similarly New Zealand and Australia are also cautious about it. May be their will be agreement between US and China. We have to look and watch for it who will dominate ?. For the time being situation is worse. Most probably after some month situation will be calm down. 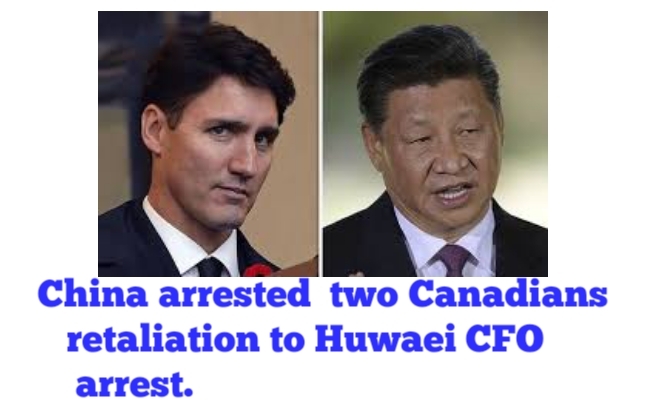 So, it was a retaliation of China arrested two canadian officials to counter Huwaei CFO arrest. ISRO new Ground Station in Bhutan, satellite technology know more.